FiGS® sets a new standard with regards to sensitivity (signal to noise ratio), being about 50 times more sensitive than other sensors on the market. The high sensitivity is key to get viable data on buried structures and allows inspections from a greater distance, making it fit for combination with GVI surveys. It also provides the direction of the electric currents, enabling us to pinpoint areas of interest, such as coating damages, faulty anodes, stray currents and more. Knowing the strength and direction of the electrical fields tells us which anodes are protecting what, and how they interact with each other. This provides excellent input to CP computer modelling of single structures, or even entire fields. FiGS® awarded the 2017 MP Corrosion Innovation of the Year Award! Read the interview with the man behind the technology. Cost-effective baseline survey of wellheads. Watch FiGS® introduction video on youtube here. 1.2	What can FiGS® give your company? A FiGS® inspection provides a full integrity assessment of any subsea assets corrosion protection system (coating + CP). FiGS® is a non-contact CP tool to assess current output from anodes, steel current density, current drain to nearby assets (e.g. wells) and more (see list below). Combining FIGS® data with over 40 years of experience in the field of integrity management and cathodic protection, we can give you a full overview of the integrity subsea. Based on the above, the need for CP retrofit can be identified. 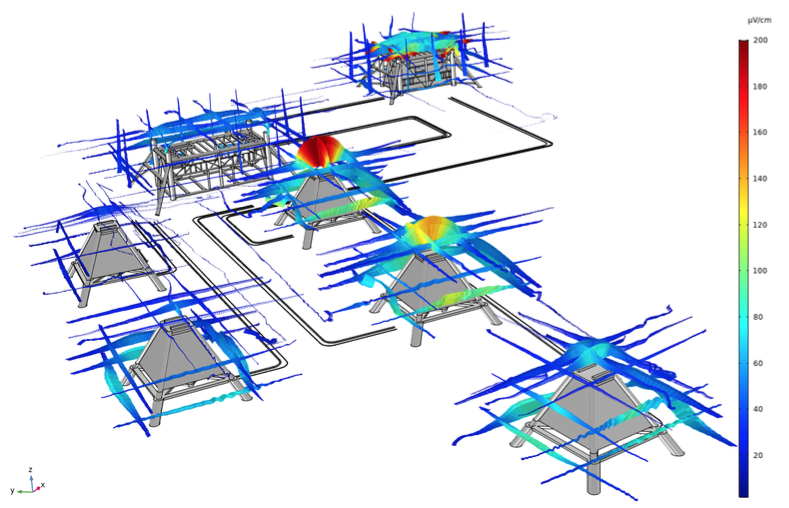 If CP retrofit is required, FiGS® data can be used to minimize extent of retrofit required by basing the retrofit design on steel current density determined by FiGS® which is typically lower than the CP design requirements of e.g. DNVGL-RB-401 (CP design for structures) or ISO 15589-2 (CP design for pipelines). 1.3	What is the advantage of using FiGS® over conventional CP and field gradient measurement techniques? There are several reasons for using FiGS® as an inspection tool, rather than more conventional methods as seen in Figure 1. Instead of providing just a potential or field gradient (activity) profile/distribution, FiGS®, combined with CP modelling using the FORCE Technology software SeaCorrTM, will provide information about anode current output (and hence estimated anode wastage), current density on bare (uncoated) steel, effective current density on coated steel, presence of coating damages (such as damages to the outer sheath of flexible pipelines and jumpers), as well as current drain from anodes to adjacent structures (e.g. to templates with wells). 1.4	Can FiGS® be used as a pipetracker? FiGS® measures strength and direction of the electrical fields from anodes to cathodes (coating damages/bare steel). By using two sensors during pipeline inspection, FiGS® can be used to triangulate the position of anodes and coating damages. This may prove useful in areas where a traditional pipetracker is not able to track the pipe, due to high burial depth, as FiGS® theoretically can triangulate anodes down to 10 meters burial. FiGS® can in such cases aid in locating anode locations for correction of pipe routing. FiGS® is a passive system and will not be able to continuously triangulate the pipe, like a pipetracker, unless the pipeline coating is continously heavily damaged, being provided with anode current more or less on a continuous basis. Figure 2. 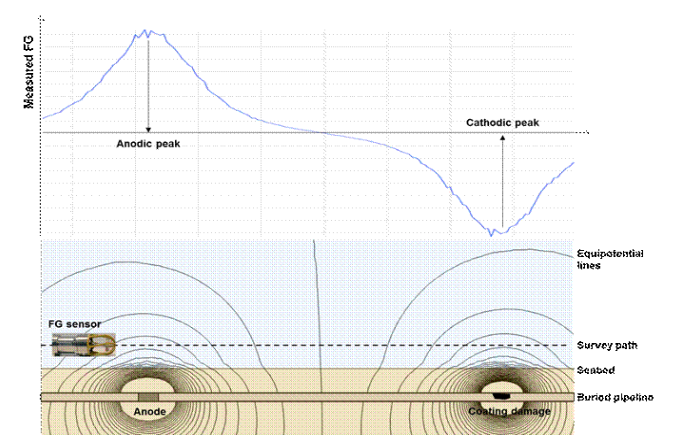 Triangulation of anode and cathode location. FiGS have also been used to locate buried flexible couplings during installation of new flexibles, by locating the anode on the flexible pipe coupling, limiting the excavation to a targeted area. 1.5	How can the potential be determined without contact? Preform a few contact CP stab measurements (e.g. at each end of a flowline) to verify the calculated profile/distribution. For a CP system in the maintenance (stable) phase, potential data from earlier surveys can be considered. Both above methods have been proven through numerous validation tests with conventional contact measurements and have been approved through several TRL7 (proven technology) qualification with International O&G majors. 1.6 What is the advantage of using FiGS® on pipelines? A FiGS® survey can be conducted with an ROV flying at a speed up to 6 km/h without losing valuable information. This is faster than any other advanced CP inspection tool on the market. 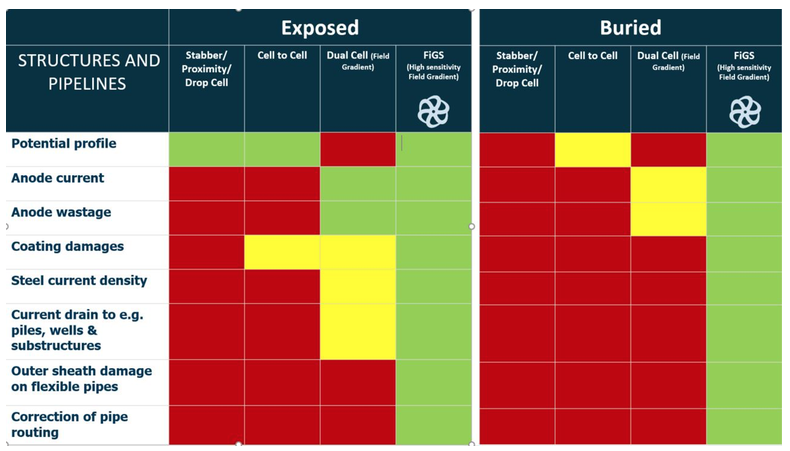 FiGS® can also be positioned higher above the pipeline and still obtain valuable data. The increased speed saves costly vessel time, while the larger measurement distance lowers the risks associated with the flight of the ROV. FiGS® can be used on buried, trenched or rock dumped pipelines, obtaining the same information as for an exposed pipeline, see Figure 3. Surveys can be performed on pipelines buried to a depth of 10 m.
Figure 3. Signal measured by FiGS® on buried pipeline – detection of anode and coating damage (cathode). FiGS® can be used together with active pipe trackers (e.g. TSS440) as the signals from the pipe tracker does not affect the FiGS® sensor readings. This feature reduces the offshore time as a pre-survey with the pipe tracker is not required. This results in significant cost savings, mainly related to the vessel rental. A typical FiGS® survey on a subsea structure usually takes 0.5 to 2 hours, depending on the size of the structure and the capabilities of the ROV. 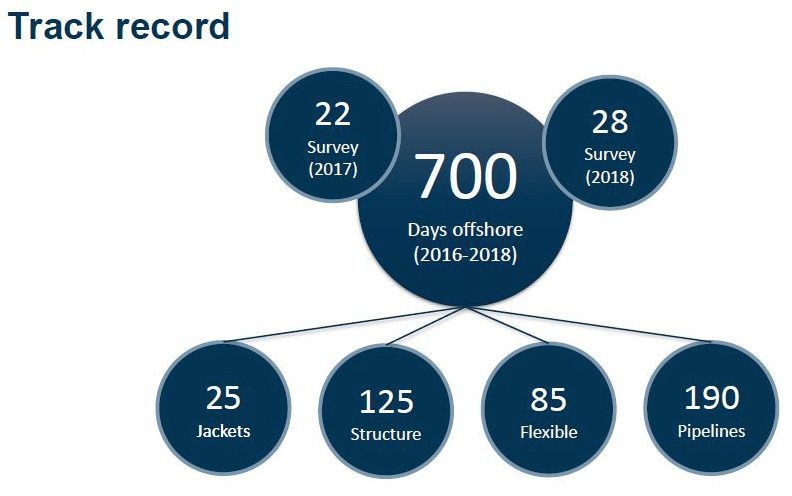 A jacket survey will normally take 3 to 12 hours depending on the size of the jacket and the number of anodes installed. The major advantage of FiGS® on structures is, however, the large amount of information obtained over a relatively limited extent of time. The FiGS® data is combined with detailed CP models developed using the FORCE Technology software SeaCorrTM and combined with our extensive experience with CP modelling this allows for identification of hotspots, e.g. areas of under-protection (see Figure 4), as well as the impact of CP current drain e.g. to wells. Figure 4. Potential distribution on subsea structure based on FiGS®- areas of under-protection (potentials positive of -800 mV) identified. 1.9	What is the advantage of using FiGS® on subsea fields? FiGS® data, in combination with CP modelling using the FORCE Technology software SeaCorrTM, allows for the assessment of the status and life expectancy of the CP systems on entire subsea fields consisting of pipelines, subsea structures and/or jackets. A FiGS® survey covering all the assets of a subsea field will identify the interactions between different CP systems, such as anodes on one structure/pipeline providing CP current to an adjacent structure/pipeline, e.g. due to a depleted CP system on the latter. Also, quantifying the current supplied as drain to connected structures that themselves do not require CP, such as platform or subsea wells, will allow for a more accurate prediction of remaining anode life. Such CP drain is typically seen on structures directly connected to wells (templates, X-mas trees, etc. ), but also on pipelines, where anodes as far away from a template as 10 km has been seen to supply drain current. In these cases, the pipeline anodes installed right next to the template are already seen as heavily depleted or are predicted to become depleted before the end of the CP design life. Thus, covering the entire subsea field with FGS® allows for an assessment of the overall status of the field, effectively identifying areas of concern. Looking at the entire subsea field as one unit instead of several stand-alone units provides valuable information for CP/integrity management. Based on the FiGS® results in terms of anode remaining life and modelled potential distribution, a risk-based approach to inspection can be selected. It is then easy to differentiate between CP systems where anode consumption is low and remaining life exceeds the remaining service life, where the interval to the next inspection can be extended, and CP systems with concerns, e.g. regarding drain issues, where more frequent inspections are required. Overall, this results in cost savings as unnecessary CP surveys can be avoided and effort can be focused on specific areas of concern and on identifying when intervention/corrective measures (e.g. CP retrofit) are required performed. One section of a subsea field with FiGS® data overlaying the model is shown in Figure 5. Figure 5. Result from FiGS® mapping of electric field around manifolds and wells interconnected with rigid spools. 1.10	Field gradient surveys have been carried out for many years. What is the main difference between the previous techniques and FiGS®? The frequently used Cell to Cell technique is based on a twin cell probe with fixed reference electrodes in a distance, typically 30-50 cm. This technology has some weaknesses in terms of accuracy because of signal noise, which during post processing is filtered to obtain a smooth line. In this process there is a risk that possible issues like coating damages are not discovered. This can happen because some of the signals are interpreted as noise instead of being picked up as a significant coating damage. In addition, drifting of Ag/AgCl reference electrodes may also affect the accuracy of measured signals. With FiGS® the noise and drifting of reference electrodes are reduced to negligible levels because the cells are in close inter distance, ca 5 cm and rotate 180 degrees measuring every quarter clock position (4hz). This way FiGS® can also measure the direction of the field, giving additional valuable information like drain to adjacent structures, pipelines etc. FiGS® does not require any form of calibration and can be run continuously from start to end of the pipeline/asset. 2.1	How close to the asset does FiGS® need to be? The distance between FiGS® and pipeline depends on factors such as extent of pipeline exposure (fully or partially exposed pipelines) or depth of burial (buried pipelines), but also on other factors governing the activity of the anodes (e.g. to which extent pipeline anodes supply current towards adjacent structures (drain). It is normally recommended to fly 1.5 to 3 m above exposed pipelines and 0.7 to 1.3 m above the seabed for buried pipelines, but the latter recommendation depends to a large extent on depth of burial. For exposed pipelines with anodes showing normal activity, FiGS® detects all anodes even at a survey height 8 to 10 m above top of pipe. For further details, please contact “cp-survey@figs.no”. 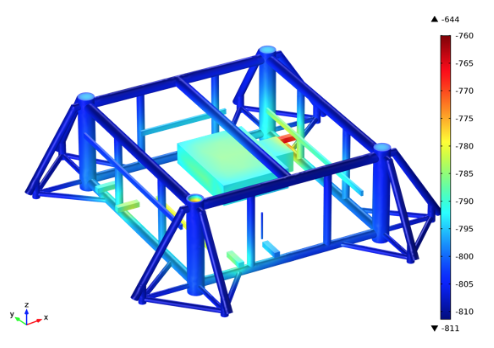 For subsea structures, mapping of the electric field is usually performed at a distance of 0.5 to 1.5 m between sensor and top or side of structure. For further details, please contact “cp-survey@figs.no”. Jacket surveys are typically performed as FiGS® contact point measurements using a distance piece. The FiGS® is held close to the area of interest for a few seconds, before moving on to the next point. For further details, please contact “cp-survey@figs.no”. FiGS® is connected to the ROV through a RS-232 connection which is supplied by the survey company. For pipelines and subsea structures (two sensors used), two connections are required, for jackets (one sensor used), one connection is required. 2.3	How far in front of the ROV does FiGS® need to be mounted? For working class ROVs the general recommendation is to mount FiGS® 1.5 m in front of the ROV to minimize the impact of the electric field surrounding the ROV on the FiGS® measurement results. The electric field varies, however, from ROV to ROV, and parts of the start-up routines in a FiGS® survey is concerned with the assessment of the actual impact of the ROV on the FiGS® measurements. In some cases, FiGS® have been mounted very close to the ROV, but data have been analyzed considering the impact of the ROV (increases the time required to perform the analyses). 2.4	What equipment does FORCE bring to the FiGS® survey? One (1) or two (2) FiGS® sensors, depending on the scope of work (jacket or pipeline/subsea structur). One (1) spare FiGS® sensor. FiGS® mounting GRP beam. The GRP beam is used to mount the FiGS® sensors onto a frame that is supplied by the ROV company. 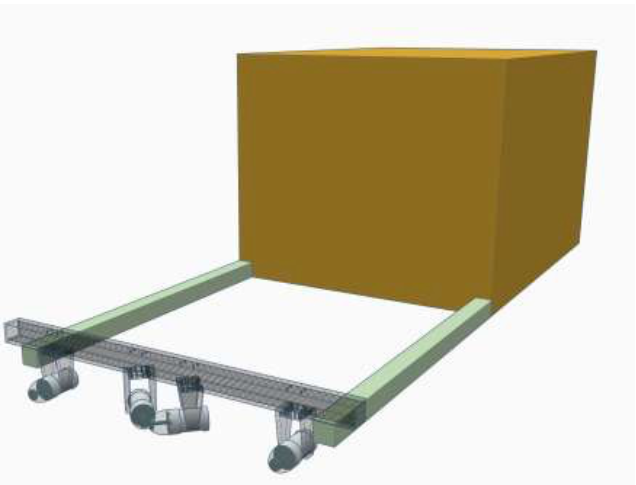 A generic example of this mounting system is presented in Figure 6. 2.5	What is the difference between a pipeline (2D) setup and a subsea structure (3D) setup with regards to mounting of FiGS® sensors? Figure 6 demonstrates the different setups for pipelines and subsea structures. In the pipeline (2D) setup, the two sensors are mounted in parallel on each end of the GRP beam. In the subsea structure (3D) setup, the two sensors are mounted in the middle of the beam, oriented at a 90-degree angle to each other. 2.6 Does FiGS® eliminate the need for a CP stabber? FiGS® data combined with CP modelling can create the potential profile for a pipeline and the potential distribution on a subsea structure or jacket. CP stabbing (on bare (uncoated) steel) is however preferred to verify the potential profile/distribution, i.e. only a few measurements are needed for this purpose. For pipelines, we generally recommend one CP stab measurement at the start and end of the pipelines (e.g. on the flanges connecting the pipelines to the adjacent structures). For very long pipelines, 1-2 additional CP stab points on bare (uncoated) steel (or anodes) on the pipeline midsection are also recommended. Results from CP stab measurements performed 1-2 years prior to the FiGS® survey can also be used as reference. For subsea structures, one single reference stab is required, but 3 measurements are recommended to verify reproducibility. Jackets are similar to structures in this respect, but may require a few more CP stab points, depending on the size of the jacket. In general, it is recommended to stab on each leg at minimum 2 elevations. See also section 1.5 for additional information. 2.7	What kind of ROV can FiGS® be used with? FiGS® can be mounted on everything from a large working class ROV to smaller inspection class ROVs. The only requirements are that the ROV can return the NAV data on required format and allow for the required maneuvering with the FiGS® sensors mounted. For further details, please contact “cp-survey@figs.no”. 2.8	What kind of AUV can FiGS® be used with? FiGS® has been tested on AUVs, but this technology is still under development. We hope to finish testing and have this option commercially available in 2019. For further details, please contact “cp-survey@figs.no”. 2.9	What is the weight of FiGS®? 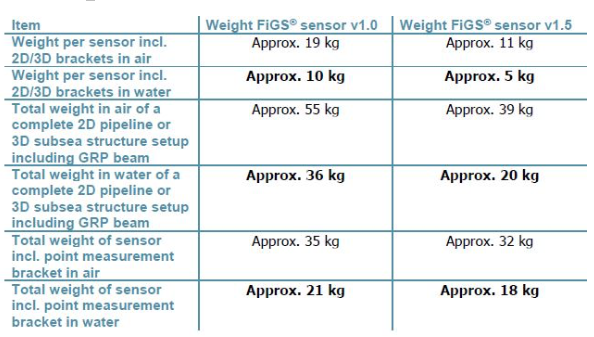 The relevant weight of the FiGS® sensor (versions 1.0 and 1.5) are summarized in Table 1. 2.10	What are the dimensions of the FiGS® sensor? Figure 7 shows the overall dimensions of the sensor. Figure 7. Dimensions of FiGS® sensor (given in mm). 2.11	Does FiGS® need any calibration? No, FiGS® only require a static measurement test in the start of the survey that takes about 15 minutes. This is only required once, unless there is a change of setup of the sensors. The change of setup is only required if one needs to inspect infield structures instead of pipelines, as structures requires a 3D FiGS® setup. For further details, please contact “cp-survey@figs.no”. 2.12	Can FiGS® be used together with a pipe tracker? Yes, FiGS® works with a pipe tracker, as they operate on different frequencies and therefore have no effect on each other. In some cases, FiGS® can give additional information regarding the pipes location if it’s buried too deep for the pipe tracker to detect. For further details, please contact “cp-survey@figs.no”. 2.13	Does FiGS® eliminate the need for a pipe tracker? No. FiGS® is a passive system and can only detect if there are active currents going from the anode to i.e the coating damage (cathode). It can be used to pinpoint active anode locations and coating damages that are buried, as FiGS® will detect the difference in current output. It won’t be able to see the pipeline between the anodes or eventual coating damages. 2.14	What kind of navigational system does FiGS® require? FiGS® needs to know the location relative to top of pipeline. In most cases, we use multibeam, INS, Cathyx lasers or an altimeter to give us relative position from the sensors to the pipeline. This is supplied to us by the ROV/AUV company. 2.15	What kind of navigational system do we not recommend using? 3.1	Where does FiGS® operate? FORCE operates with FiGS® worldwide, having done several surveys in Scandinavia, Europe, Malaysia, North America and Australia. We currently have 18 operators and 12 IMR contractors on our client list. We are always open for new markets and countries to operate from. Current track record (October 2018) is listed in figure 7. For further details, please contact “cp-survey@figs.no”. 3.2	How many operators do you need to conduct a FiGS® survey? Two operators are needed for 24-hour operation. One operator is needed for 12-hour operation. FiGS® require the personnel to be trained in our facilities in Norway. Thus, we usually supply the equipment and personnel for every survey. 3.3	How many FiGS® sensors are required for a survey? Normally FORCE uses 2 FiGS® sensors on a pipeline survey. In theory this can be done with 1 sensor, should the ROV be so small that it cannot handle 2. This has been done in the past with good success. For structures, 2 sensors are required. This is due to the 3D setup that is used to model up the asset. For jacket surveys only 1 sensor is required, as this is done with a non-contact point measurement setup. For further information regarding the different setups please contact “cp-survey@figs.no”. It usually takes 15 minutes to mount FiGS® on the ROV. The same goes for the switch in setups from 2D (pipeline setup) to 3D (infield structure setup).